I'm sure you're all familiar with lip balms but what about MEGA balms? And one from Hershey's? 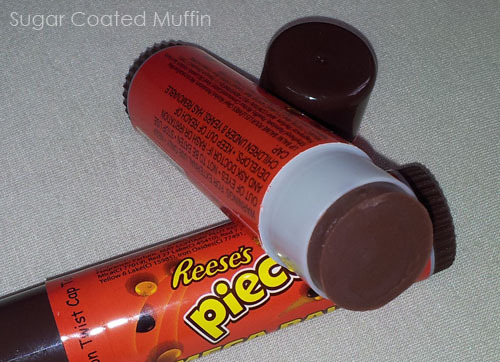 It's like chocolate in a tube that you smear on your lips @_@! However... It is not meant to be eaten as food! It's alright to lick your lips but not to eat a few tubes for lunch (diet plan gone wrong?). This lip balm smells like chocolate!! Some find it too sweet but I like it. It smells alright on my lips..
One main concern about a 'chocolate lip balm' : Will it look like I ate a chocolate bar and forgot to wipe my mouth? 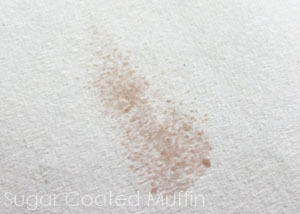 Well, as you can see in the swatch below, it's a sheer reddish brown. I don't see any difference on my lips though. I guess it's quite similar to my natural lip colour. Ingredients :Oleyl Alcohol, Petrolatum, Microcrystalline Wax, Ethylhexyl Palmitate, Paraffin, Ricinus Communis (Castor) Seed Oil, Lanolin, Sodium Saccharin, Fragrance/Parfum. My conclusion : Will I repurchase this? Well, it's so big that I'm not sure when I'm gonna finish it but I guess it's worth purchasing if you love fun lip balms and you love chocolate! RM8 is super super cheap leh!! I really wanna buy it now but I have so many lip balms! Seriously I don't think I've ever finished a single tube of lip balm. Hehehe... That's what I thought.. but I've somehow managed to finish a few in my life xD Its a miracle..! i can almost smell it! :) that's such a good buy too! i think it looks natural on you and i bet it smells soooo yummy! oh Yes it does! *sniffs lip balm* If Im not mistaken, 400 pieces (this and other variants) were sold!